Yes but you have to upgrade first then you can do a clean ISO install. It doesn't matter. It will be updated to GA (and beyond) through windows update. 3. What do all these different build numbers mean? build 10240 is the release that will happen on July 29th. Insiders already got it. Builds 10500 are in the TH2 branch and will be a future release. 4. Why can't I activate right now? You had to be an insider participant already, and had to have build 10162 or 10166 installed. All previous keys are frozen as well as some to the activation. Yes there are other ways such KMS to activate but officially new activation is closed as well as previous key are locked. Search the forums for the KMS however it is not an official activation. 5. What are these terms I keep seeing such as RTM, GA, etc.? RTM means Release to manufacture...it means the source code was good enough to install for PC for market. It does not mean the code is finished or done, and it certainly does not mean release to market. GA means General Availability It was the term meaning when the source bits hit the shelves basically, however in the digital age we now live in it is meaningless. Other terms that are now dead...Alpha- very early code, not generally available, beta-better then alpha code, RC1- release candidate 1, RC2- release candidate 2, these were all various stages of software development. All of these terms are now outdated in today worlds, including RTM and GA.
7. If I wanna get Win 10 Enterprise, will i need Win 7 Enterprise and it will automatically know to upgrade to win10 enterprise? Enterprise is not part of the free upgrade and volume licensing, so people running those will not get it direct..Microsoft has stated they need to see their companies for that. 8. Lets say we upgrade from win 7 to win 10, i suppose we wouldn't need to key in any key, BUT after we begin doing a clean installation (especially when via unattended) is there a stage where we need to key in a product key ? if yes is it during setup or post-setup? To meet the terms of the free Windows 10 you must upgrade from a qualifying system based on the matrix I linked to in a previous question. Once you have upgraded you do not need a product key, nor do you need a key when upgrading from a qualifying system (OS). Once you have upgraded at least once you are free to do clean installs, at some future point Microsoft will be providing ISO. 9. Can I use the leaked OEM image file? Indications are yes as we have no reason to believe our activation can be changes. Simply rename it ISO and use a tool like RUFUS to burn it to a USB drive or mount within Windows. Note at this time you already had to be Insider with your current hardware to activate and had to be running builds 10162 or 10166. Activation is frozen. Yes there are other methods but that is not the purpose of these FAQs search if you need another method. 10. Can I upgrade through VHD? No, native VHD boot doesn't support upgrading the Windows version. You cannot check which update to install and which to disregard using checkboxes in windows update? This is such a f@cking compromise. But are those updates (PRO version) installed automatically, or can one defer the installation? System updates are welcome, but MS has in the past released flawed updates. The problem is if the driver updates will be forced. All updates are mandatory, and automatic for Home. Pro can defer feature updates for a time, but not indefinitely. Security updates are still mandatory for Pro and cannot be deferred. Enterprise can choose which updates to apply or not, same as current setup. Enterprise administrators still have full control over deployment of updates using WSUS and SCCM. 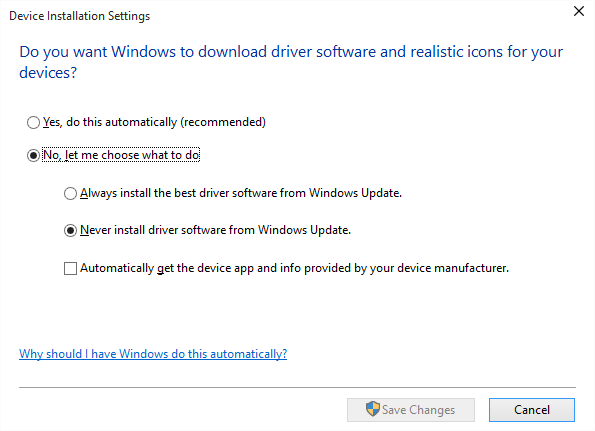 Based on further reading, the windows update in win 10 forces driver updates. Although there is a post saying that can be fixed by using policy editor. Windows as a service, yeay! I finally was able to install Win 10 on my backup machine. The key was the update step before install. Before I repeatedly skipped that step thinking there shouldn't be updates at this early stage. Maybe on that step it downloads critical drivers for my machine. I'm running windows 10 pro now, needs to adjust for some things since they have changed since 8.1. I love the hybrid start menu, there's no more need for me to use start10 and modern mix. Too bad that cortana isn't available in the philippines yet. This os is a keeper for me. so, people have been complaining that auto driver updates in win10 have been breaking systems with nvidia cards. i hope they fix the mechanism for this soon as i'll be building a new rig with a gtx970 as target gpu. ^^ i also have the gtx970 on my rig right now. since upgrading to win 10, windows update has not offered me any driver update. I have the 353.51 driver installed. ^ On an earlier preview build you could turn off automatic driver updates in System Properties > Hardware > Device Installation Settings. I don't have a copy of the RTM build though. July 29 na. It is the day Windows 10 goes live. Even if some of us performed Caesarian section. Almost 2 weeks (2 weeks is the longest I have been on Win 8 at any given time, hehehe) on rtm and I have yet to experience any system slowdowns or crashes, liking it so far with just a little annoyances here and there. It has exactly the same hashes of the leaked rtm, hehehe! finally!! natapos na din ang upgrade from win 7. That happened to my backup rig and I tried a lot of times. I finally succeeded when I let it download updates during install. The machine at home is slowly filling the hidden $Windows.~BT folder with what seems to be the installer image. It runs all day and is turned off only past midnight. Does anyone use Vegas 11 here? Is it still working fine on Windows 10? It is usually tougher on the main rig. It usually contains lots of programs and your precious data. If you plan to keep all data and programs, the free space should be more than 50% of the drive's capacity. The installer will make copies of the old user data to the windows 10 user folder without erasing the old data. You can select not to keep user data. The old user data isn't lost. The installer will move them to a windows.old folder. After installation, you can recreate the old user accounts and manually transfer files from the windows.old folder to the new user folders. You can then erase the windows.old folder using drive cleaner.